A prerequisite for being a leader in God's House is being full of wisdom and full of the Holy Spirit. 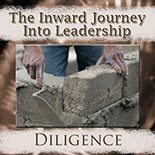 Leaders also demonstrate diligence in their lives - not "being busy" but having a will and heart passionate to see God's will done. They are about the Father's business and tireless in serving His people. If we aren't currently living that way, we can adjust and be there! Does Your Heart Testify GOLD?